My grandmother Johanna, or Grandma Jo as I called her, was a honky tonk piano player. Of Irish and Nova Scotian origins, the enigma of her paternal line was as mysterious. My own maternal side was a trail of girl children with unknown fathers for several generations. Fallen women, fallen and floating. Grandma Jo rose above and out of her own trail of tears on the notes of an upright piano. No one could ever answer the riddle of how she learned to play like that. Devil music, like the coloreds play, they said when I was little, and a quadroon is what they called her when they thought she wasn't listening. I knew Grandma Jo had black in her, knew it was true from the time I caught my first glimpse of a black man, recognizing the curve of the nostrils, the full lips, the voice with a vibrato as wide as the Cuyahoga and just as deep and mysterious. I was happy to share the black in her blood, happy for any little thing that kept me outside the lines always threatening to jail me in. Grandma Jo gave me music, Harry Houdini and St. Thérèse of Lisieux, of the Little Flower. She revered this triad, and I followed her into their worship toward my own flight. Grandma Jo was raised Irish Catholic in French Canada. After my mother was born, she married a stern plank of German Lutheran who hated her joy; her piano. He knocked the notes and the saints right out of her, or so he thought. Jo was a grand actress. When he went off to work, she’d bring me to her rose garden, into the secret of her worship and love of the Little Flower. He can’t see who the roses really are, or what they mean, and she’d shake her head in a sad gesture, touching a velvet petal ever so gently while she spoke. If you pray and devote yourself to St. Thérèse, the saint will send you a rose and your prayers will be answered. When you behold a rose, what do you see? Everyone you meet will see the rose in a different light. ​Can you imagine living only in the dark? Abandoned by both mother and father, Edith Piaf spent much of her early childhood raised by prostitutes in her grandmother’s brothel. Her eyesight was failing, edging toward blindness when one of the girls working there brought her on a pilgrimage to Lisieux, to the shrine of St. Thérèse. She and Edith begged the saint to restore little Edith’s sight and, the miraculous happened; upon her return home, the six-year-old Edith regained her vision. After the miracle Edith prayed every night of her life on her knees next to her bed, to her angel of salvation St. Thérèse. Yet when Edith died the church forbid her a Roman Catholic mass because of her “unconventional lifestyle.” Scalding proof of the Roman Catholic Church’s inclination to betray the wishes of God’s only Son. St. Teresa of Avila was another kind of saint who understood ecstatic union with God through self-mortification and suffering. I came to her when I was older, through a poet I knew whose devotion to her was more intellectual. She loved St. Teresa for her writing, her ecstatic poetry. The order of Carmelites that St. Teresa reformed in the 15th century was the same order that St. Thérèse of Lisieux would join at a mere 15 years old. 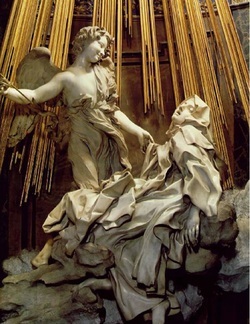 Teresa of Avila knew God in a most intimate, mystical way, and her meditations turned her body into an ecstatic pulse of divinity, entombed forever in Bernini’s statue, the heat of stars flooding her veins. Two Therese’s, two ways of grace. Edith found her lost mother in Thèrése of Lisieux. The poet navigates through starlight by way of Avila’s Teresa. Why are we so quick to judge those who believe? For all who break free into the ecstasy of divine love, if only for a moment.